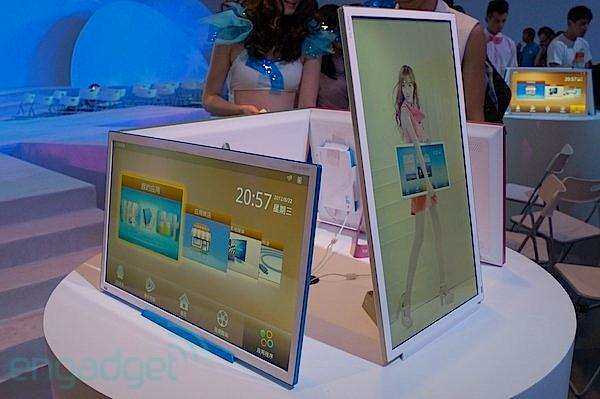 The above image is a 26-inch Android-powered Smart TV From companies Tencent and TCL. It is called the “Ice Screen”and it is the first large screen mobile entertainment smart cloud product in the world. It is powered by a dual-core Cortex A9 1GHz processor with a Mali 400 GPU for graphics, 4GB of RAM, a microSD slot, USB and HDMI connectivity, 1366 x 768 resolution Wi-Fi and a 3.5mm headphone jack. The launch date is September 3rd, it is going for roughly $315. You can read the press release Here.